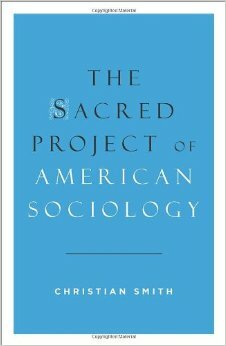 I recently read Christian Smith’s new book, The Sacred Project of American Sociology (Oxford University Press, 2014). Smith is a professor of sociology at Notre Dame (and will be speaking for Spring Arbor’s Focus series in March). His work is well known in sociology of religion circles and he is one of the principal investigators on the National Survey on Youth and Religion. Sacred Project is a different kind of book than his more empirical work. A footnote in the introduction spells out his strategy: “this book can be read as ‘a sociology-of-religion of sociology-as-discipline’ (p. x).” Smith is using Durkheim’s work in a very specific way, so it’s good for me to paint a quick picture before getting to the substance of his argument. Emile Durkheim’s work in Elementary Forms focused on the beliefs and practices of Australian Aboriginal tribes (based on fieldwork by his nephew). It’s “elementary” because it is the most simple and primitive approach (at least according to Emile). It’s a clan organization with a divided sense of time: there is origin time and everyday time. The origin time in populated by spiritual beings/animals (which is why it’s called animism) who work out the creation narratives. Everything else in everyday time is a recreation of the origin time. The rituals the group engage in are representations of that time that is sacred, “that is, set apart and forbidden”. But Durkheim’s analysis concludes that the sacred realm is a reproduction of the group’s social order and that the outcome of the everyday rituals is to guarantee fealty to the group’s values. A related element is Durkheim’s work is that such tribal societies deal with deviance and rule-breaking by what he called repressive law — violators were excluded from the tribe. It is in this narrow way that Christian Smith is talking about a Sacred Project in sociology. Like the origin time for the aboriginals, there is an overarching story that binds sociology and a system of ritual practice that reinforces that story on a regular basis. The actual sacred story is rarely if ever examined. I’m more comfortable with the first half of the formulation than with the second. Sociologists do share a vision that perhaps can best be stated as critique: we’re concerned about exploitation, about the contingencies of birth, about dynamics of social inequality. In short, the dynamics of structures and patterns within the larger society that unduly rob some of “life, liberty, and the pursuit of happiness”. There is a shared and unexamined notion that our ideal sociological world wouldn’t look like that. We might say that it stands in the modern-liberal-Enlightenment-Marxist-social-reformist-pragmatist-therapeutic-sexually liberated-civil rights-feminist-GLBTQ-social constructionist-poststructuralist/postmodernist “tradition” (p. 11, italics Smith’s). He traces the development of American sociology from its Chicago days to its current state and seems to suggest not only that all of these descriptors are connected, but embraced by the discipline. Some of them are directly contrary. It is undoubtedly true that sociology has had a bias for those left behind within society — from Chicago’s Polish girls to contemporary issues around race and criminal justice. Smith reviews recently published books at ASA meetings, themes in contemporary sociological journals, or major assumptions underlying conference themes. He spend a chapter doing a remarkable critique of the leading Intro to Soc textbook (Macionis), suggesting that the tripartite structure of theory groups (structural functionalism, conflict theory, and symbolic interaction) works to a) show conflict theory as preferable to order theories, and b) to legitimize the social constructivist assumptions of modern sociology. Another important critique is that research gets repeated that seems to match the default assumptions of the Sacred Project even when it’s been critiqued long in the past. These patterns, it seems to me, have a great deal to say about the institutional structures of the sociological enterprise. How does one get to be an intro book author or reviser? Which books get reviewed by major publications? Perhaps to get a book noticed by an editor one has to pick up one of the victimization themes common to the book exhibit. What I’m suggesting is that the sociological analysis we’ve all gotten used to can be turned back on sociology. Another layer to this is also evident in Smith’s argument. He recognizes that the patterns he describes don’t reflect the biases of most sociologists but do speak to elites. They also are represented within the major doctoral programs and promotion-tenure processes in competitive sociology departments. A key element of the book has to do with the way conservative sociologists have been treated in the discipline. He spends most of a chapter reviewing the Mark Regnerus saga from 2012 (Smith wrote a defense of Regnerus in the Chronicle of Higher Education). There are very real issues of research being used for or against certain prescribed positions and sociology is not better off for such exclusion. This is where Durkheim’s repressive law comes in. Take a position outside the established view and risk exclusion — figurative at best, career destroying at worst. This isn’t an isolated argument. Just today, I saw a report from a group of social psychologists describing the theoretical problems arising from a lack of political and ideological diversity. My friend George Yancey has regularly been researching issues of ideological discrimination within academe. So I’m left agreeing with Smith in part and disagreeing in part. Sociology does seem to take default positions, evident in textbooks and research presentations, that there is only one idealized vision of how the world should work. Even though there is far more diversity among sociologists in general than there is within the elite echelons, those of us calling for a more complex position are somewhat deviant (this is especially true for the sociology of religion subset). And yet I’m not as troubled by the various labels described in the second quote above. Sociologists, especially Christian sociologists, are rightly concerned with issues of inequality, of diminishment, or power abuse. Not because we blindly adopt an enlightenment rationalist vision. But because we’re pursuing a Kingdom vision. It is a sacred drive but it’s a different sacred project than Christian Smith describes. It’s one that takes God’s restoration of creation as its telos. One more thing: he ends his book with an appendix describing what he calls Critical Realist Personalism. In this view, which I really want him to unpack further, he wants us to explore the complexity of causal forces in the social structure. More importantly, he wants not to focus on autonomous individuals but “persons”. Rather than drawing on Enlightenment images, he wants to draw on Aristotelian interconnectedness. This approach also is consistent with basic Christian theological assumptions. In the end, while I certainly agree with much of Smith’s critique, I am more optimistic about the alternatives. There is a great deal for students to pursue even without the biases he’s worried about. It’s a Sacred Project truly worth pursuing.